The T15-WD has a single-pole switch-contact. When exceeding the set temperature, the thermostat switches to on or off. 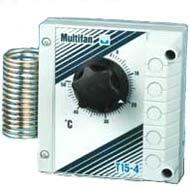 The T15-2 is a combination of two single mechanical thermostats, which are separately adjustable. 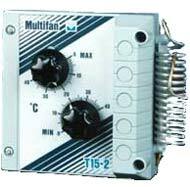 This enables the determination of the zone width, between minimum and maximum temperature. 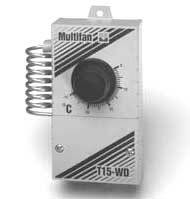 The T15-2 has two single-pole switch contacts and is extremely suitable with alarm equipment for monitoring the temperature. The T15-2 is a preferred type for use with the Multifan SEA or for connecting directly to a fan. A mechanical multistep thermostat with a single-pole contact and 5 switching positions. At each rise of 1°C, it switches to the next position. 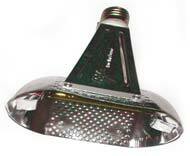 The T15-4 can be used with Multifan SEA, STW-A and STD-A or with controls of other manufacturers.